It is our pleasure to send you the August Edition of ISP Brief, the monthly newsletter of the CSIS International Security Program. ISP Brief features articles and commentary written by our scholars, their analysis as published in various media sources (including video and audio highlights), and links to recent events. We hope the newsletter provides you, our readers, a snapshot of the excellent work underway in ISP, and the engaging thoughts of our experts. As always, your feedback is welcome. READ "What Will Americans Do About Their Fear of Terrorism?" by Kathleen Hicks, in The Atlantic. READ "The wrong way to reduce military compensation" by Todd Harrison, in POLITICO. 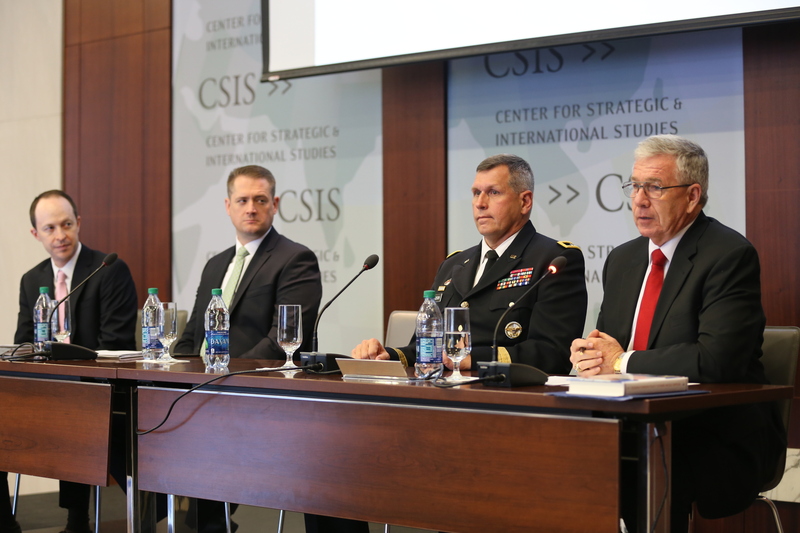 READ "Modernization: Army Leadership Must Seize Initiative" by Andrew Hunter and Rhys McCormick, in Breaking Defense. READ "Asia's Looming Subsurface Challenge" by John Schaus, Lauren Dickey and Andrew Metrick, in War on the Rocks. READ "Who's Responsible for the Navy's Carrier Shortage?" by Mark Cancian, in War on the Rocks. READ "Stop Eating the Seed Corn: The Growing Squeeze on Missile Defense R&D" by Tom Karako, in Defense News. READ "End the First-Use Policy for Nuclear Weapons" by James E. Cartwright and Bruce G. Blair, in The New York Times. 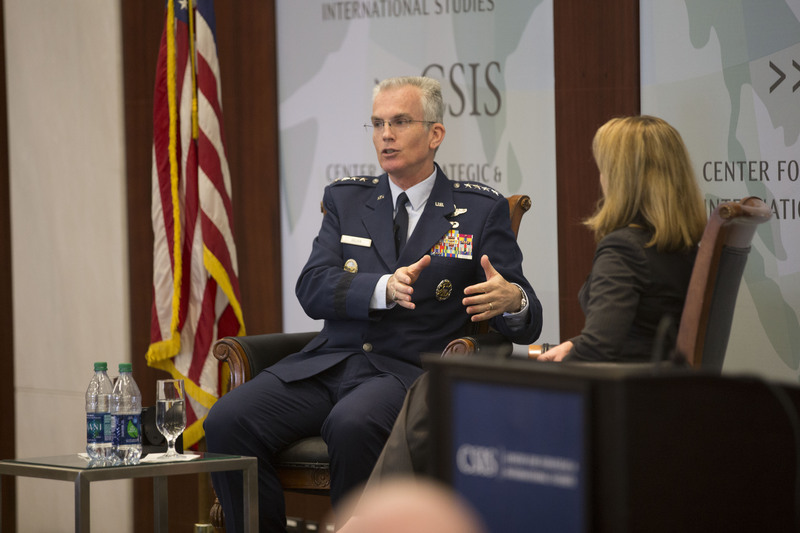 READ "The Assurance and Deterrence Conversation in the 21st Century" by Rebecca Hersman, in The Huffington Post. READ "A space sensor layer for missile defense" by Tom Karako, inSpaceNews. READ "The Missile War in Yemen" by Tom Karako, in Missile Threat: CSIS Missile Defense Project. READ "Unpacking Syria's Chemical Weapons Program" by Rebecca Hersman, in CSIS's Critical Questions. 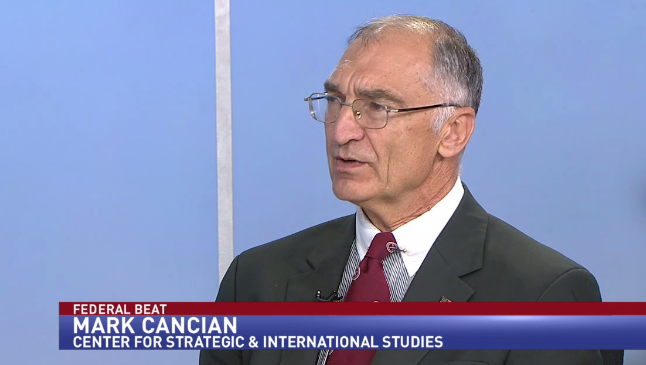 WATCH Mark Cancian take part in the Federal Beat roundtable on NewsChannel 8's Government Matters program. 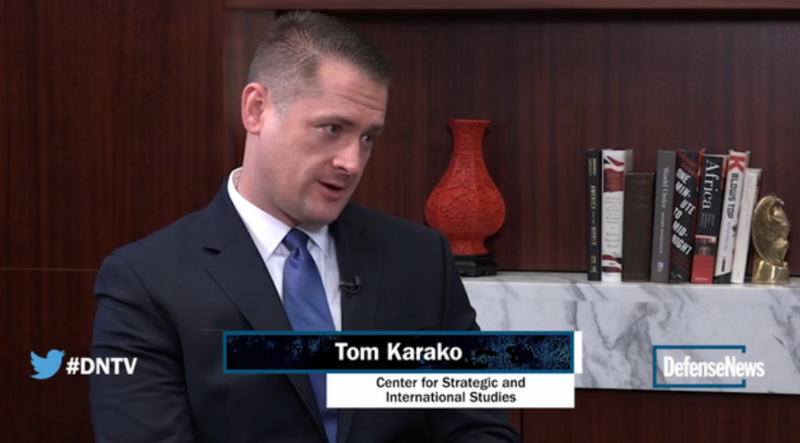 WATCH Tom Karako's interview with Jen Judson on the missile defense gap on Defense News TV. WATCH Tom Karako and Jen Judson discuss the cruise missile threat on Defense News TV. 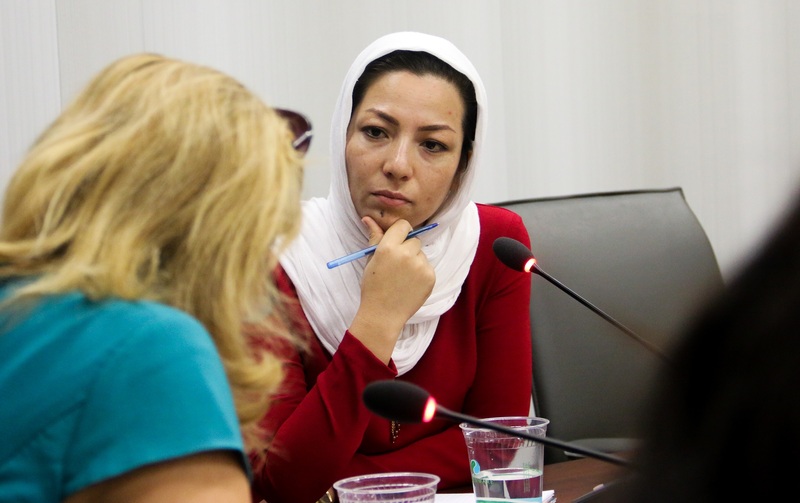 LISTEN to the Smart Women, Smart Power podcast featuring Fatema Jafari, member of the Provincial Council of Herat in Afghanistan, discussing her election and her efforts to get women involved in Afghan politics. LISTEN to Tom Karako discuss nuclear weapons in the next administration on CBC Radio. WATCH Andrew Hunter's interview about Goldwater-Nichols reform on the Defense and Aerospace Report. LISTEN to Rebecca Hersman's interview about Syria's use of chemical weapons with Australia's ABC News. “It seems to strain credulity if the Security Council can come to unanimous agreement up to the creation of the JIM, and then somehow refuse to act when the JIM puts before them credible evidence and very serious reporting that clearly points to attribution,” - Rebecca Hersman quoted in The Cipher Brief article "UN: Assad Used Chemical Weapons in Syria" on August 25, 2016. “I think the fundamental question for the United States, and also for the OPCW, is — have we come to the end of the road in terms of our ability to pursue a reasonably cooperative process with the Syrian government?” -Rebecca Hersman quoted in Foreign Policy's article "U.S. and Europe Say Assad May Have Kept Some Chemical Weapons" on August 23, 2016. “I think the message is that Russia is a major power in Russia’s mind, and ‘don’t take us for granted. Treat us as the power we believe we are.’” - Kathleen Hicks quoted in The Wall Street Journal's article "Russia Emerges as a Campaign Issue That Can't be Ignored" on August 19, 2016. "Tom Karako, a missile defense expert with the Center for Strategic and International Studies, said lasers might be sooner used for tactical missile defense, currently done by systems like Avenger or Israel’s Iron Dome, but in time could be mounted on drones that would attempt to shoot down the missiles soon after they blast off." 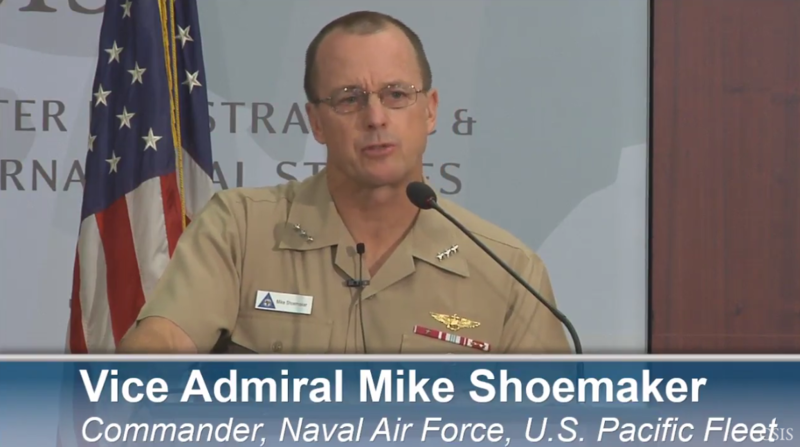 -Tom Karako quoted in the Defense One article "Pentagon: We're Closer Than Ever to Lasers That Can Stop Iranian, North Korean Missiles" on August 17, 2016. “This should be very important to President Obama because he’s so committed to looking for alternatives to military force to resolve these kinds of issues,” - Rebecca Hersman quoted in POLITICO's article "U.N probe could pose new Syria dilemma for Obama" on August 17, 2016. "NATO involvement in counter-terrorism issued its first formal declaration on terrorism in 1980, and it became a significant issue for the alliance on Sept. 11, 2001, said Lisa Sawyer Samp" - Lisa Sawyer Samp quoted in the PolitiFact article "Donald Trump mischaracterizes NATO change and his role in it" on August 16, 2016. 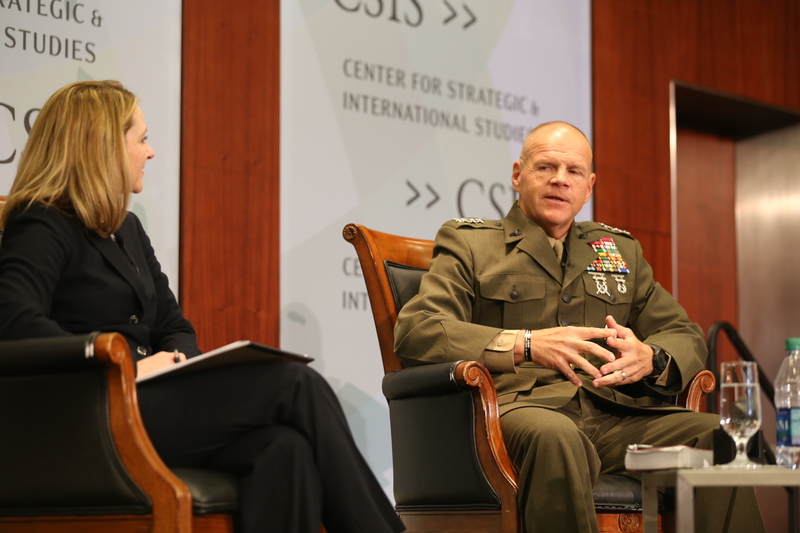 "Mark Cancian, a senior adviser at CSIS, said the Marine Corps is already developing “innovative concepts” in the way it organizes its units." - Mark Cancian quoted by Federal News Radio in the article "Future Marine Corps units could have assistant squad leaders" on August 9, 2016. "I do think for both current candidates there's a lot of resonance with the idea that innovation is a priority and in particular access the best and brightest," - Andrew Hunter quoted in the Washington Examinerarticle "How Pentagon tech push could shape in next administration" on August 4, 2016. "That's something they're going to be handing over to the next team. So the next administration, Clinton or Trump, they're going to have to figure out this problem," - Todd Harrison quoted in the Washington Examiner article "Analyst: Budget caps are the biggest problem facing the next administration" on August 2, 2016. "The ICBM 'milestone marks the official beginning of the technology development stage where contracts will be awarded and spending' will 'begin to ramp up,' from about $75 million this year to $1.6 billion in 2021, Todd Harrison, a defense budget analyst with the Center for Strategic and International Studies, said in an e-mail." - Todd Harrison quoted in Bloomberg Technology in the article "Pentagon Poised to Approve Work on New Nuclear-Armed Missile" on August 2, 2016. "NATO allies including Poland, Germany and Denmark 'are expecting options for new air and short-range missile defense capabilities in the face of what appears to be a changing Russian posture,' said Thomas Karako." - Tom Karako quoted in National Defense Magazine article "International Missile Defense Market Heats Up" in August 2016. "O’Hanlon and Hicks argued, 'European members of NATO are absorbing the greatest costs and risks in applying sanctions on Russia over its behavior in Ukraine' and Europe 'was also collectively crucial in applying sanctions on Iran.'" 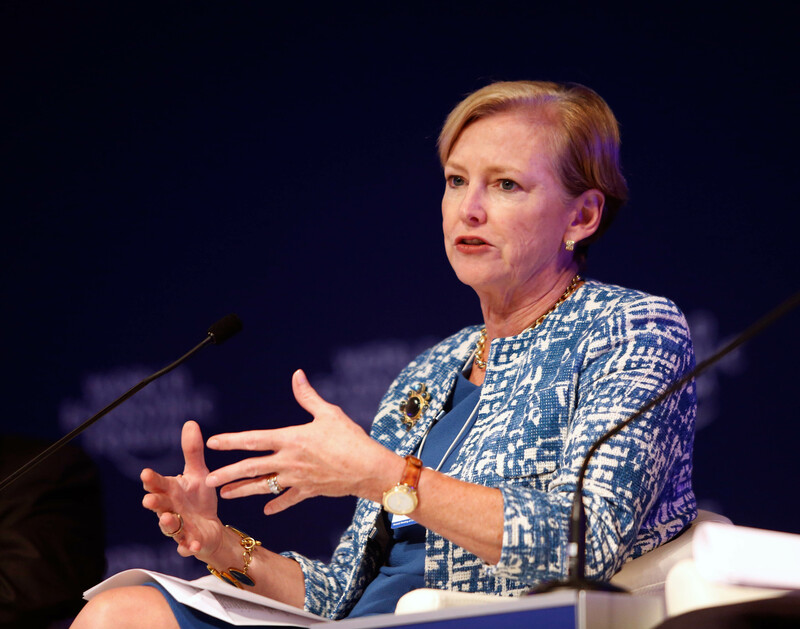 - Dr. Kathleen Hicks quoted in theBrookings Now article "Making sense of NATO on the US presidential campaign trail" on July 29, 2016.